PETER NYBERG HAS told the Banking Inquiry the Report he compiled into the Irish banking crash in 2011 “does not imply” people here “all partied”. He was responding to a question asked by Fine Gael Senator Michael D’Arcy. Earlier this morning, Nyberg told the Inquiry the Irish Government took the “safe option” when it chose to bail out the country’s banks. The Finnish economist said the decision was “the culmination of a lot of mistakes that were made several years before and not only by the Government”. He said “real estate mania” played a large role in Ireland’s crisis, and that of other countries. “The decision of the Government to guarantee most liabilities of Irish-owned banks on September 29, 2008 is not surrounded by a lot of documentation. The willingness to guarantee the banks’ liabilities appear consistent with a lack of serious concern by public authorities about the solvency of Irish banks at that point in time,” he said. Nyberg is the first witness to appear at the inquiry’s public hearings. In 2011 a report he compiled on the baking crisis here found that the willingness of banks to issue high-value loans for risky commercial property was a fundamental cause of the banking crash. He went on to say the bank guarantee “seems to have been based on a belief that the Irish banks were solvent and their liquidity problems therefore were temporary”. Nyberg said the Commission he chaired understood that the Government “saw no workable alternative to the guarantee”. This does not imply that it was objectively the best decision possible under any set of circumstances. However a decision had to be made with only the knowledge and preparations available at the time, and had to be made fast. Nyberg said the Commission was tasked with determining the ‘why’ of the Irish crisis, not the ‘who’. Before they began their work, he said it was “obvious” where responsibility lay – with the directors and senior and junior staff for the decisions they made and with the borrowers for risks they took. 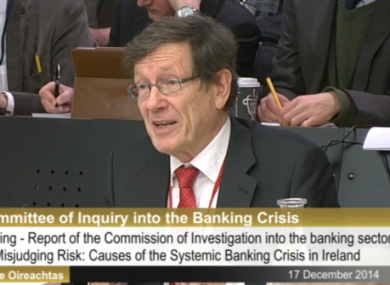 Nyberg said that ignorance, and not criminality, was to blame for Ireland’s banking collapse. There seems to have been fairly little outright criminality in the run-up to the Irish crisis. The excessive risks taken, and the subsequent losses, appear to have been the result of ignorance or lack of understanding. This corresponds to experiences elsewhere, as well as to the experience from Finland in the 1990s. Labour Senator Susan O’Keeffe said Nyberg’s description of ‘ignorance’ as being to blame for the collapse was “benign” and somewhat over-simplified what happened. Nyberg, who interviewed people for his report anonymously, said he could not use the word ‘negligence’ when referring to bankers and politicians as “it implies some sort of willfulness and I just didn’t see that”. He said the commission had received legal advice whereby anything that was or could become under criminal investigation shouldn’t be pursued, adding the group didn’t come across anything that had to be given to An Garda Síochána. Nyberg said a “group-think” mentality was evident in several countries including Ireland where nobody was willing to “stick their head up” and look for flaws in the financial system. People were willing to accept risky behaviour from banks. Everyone was unprepared when the crisis came. “The Irish institutions were pretty good at misjudging risk,” Nyberg added. Sinn Féin’s Finance Spokesperson asked Nyberg why lending increased so sharply form 2005 onwards. He responded by saying Anglo was a “monoline” bank financing big developers, and “tried to fulfill needs of customers”. Nyberg said that “in the last 20-30 years simple [lending] guidelines were “replaced by extremely complicated models of risk”. He suggested we consider reverting to a simpler system to avoid a bank “taking the whole country with it” if it collapses. Fine Gael TD Eoghan Murphy asked Nyberg to elaborate on why his 2011 report says “vigilant authorities” should have been more worried by end of 2005. The economist responded by saying the that information included in the bank’s annual reports, as well as anecdotal evidence, made it objectively “obvious” the boom could not last. Socialist TD Joe Higgins asked if a desire for excessive profits by banks and property developers drove the collapse. Nyberg responded by saying all businesses, not just banks, are out to make a profit. “I really can’t make a judgement on whether profits were too large,” he said. Nyberg also noted that while compiling his report he did not interview anyone from the European Central Bank, the International Monetary Fund or the OECD. He said it was up to the ECB, not him, to explain why it didn’t allow Ireland to default. The economist also said it wasn’t his place to say if more senior bondholders should have been burned, as he did not look into this particular issue. Nyberg noted that while he is aware that some people believe certain politicians and bankers share too close a relationship, he found “no evidence” of this being the case during his investigation. Nyberg said positive media coverage of banks and the real estate market did affect the crash, but he wasn’t sure to what degree. Very few people read banks’ annual reports but everyone reads the media or looks at TV. It’s unlikely something really exciting and new will emerge … In my view, the causes of the Irish crisis are now well known. He said the investigation might give an opportunity to look at certain aspects of the financial collapse in “greater depth” and lead to a plan of what should be done to avoid the same thing happening again. Committee Chair Ciarán Lynch said he knew there was “a big challenge ahead” and “the clock is ticking” but he noted that all members are ready for the challenge. Email “'Not everyone partied but the bubble meant their lives were better'”. Feedback on “'Not everyone partied but the bubble meant their lives were better'”.